Tampa Bay, FLA (October 19, 2018) – Tampa Bay Watch is celebrating their 25th anniversary this coming November. The local organization is hosting its annual “Evening for the Bay” gala, themed “Wave of the Future”, on Saturday, November 3rd from 5:00pm – 9:00pm. The event will feature neon lights and futuristic innovations, dinner sponsored by Bonefish Grill, and complimentary refreshments sponsored by St. Pete Distillery, Cooper’s Hawk Winery & Restaurant, Great Bay, and Coppertail Brewing. Guests will also enjoy live music, magical performances, and live and silent auctions. In celebration of the organization’s silver anniversary, Tampa Bay Watch encourages guests to dress in hues of silver. Special thanks are given for this year’s presenting sponsor, ASI Progressive Insurance, core sponsor, Healthcare IQ, in-kind sponsors, and table sponsors including Tampa Bay Rays, Shutts & Bowen, Alden Suitesand Sabal Trust Company. This year’s live and silent auctions will include exotic trips to Belize, Caribbean cruises, wine tours through Sonoma, local adventures, and more. auctions, contact Michelle Andersen at mandersen@tampabaywatch.org. All goods and/or services donated will be tax deductible to you or your business. 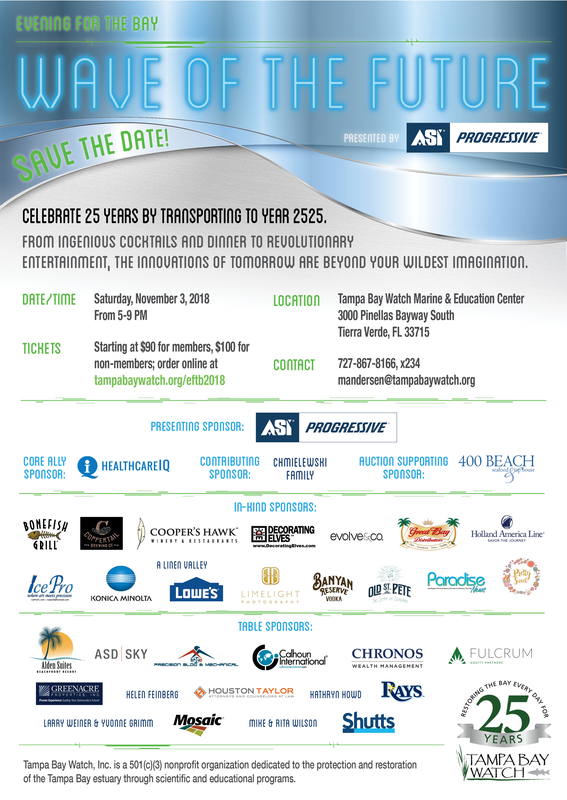 DETAILS: Tampa Bay Watch’s 25th anniversary cocktail event featuring cocktails, dinner, live entertainment, auctions, and more. PARKING: Complimentary valet is available for guests. Editors: For details, or to schedule an interview contact Lizzie Desrosiers lizzie@evolveandco.com or 727.490.9835.